A Tool Rack filled with several tools. The Tool Rack allows you to display up to four tools. 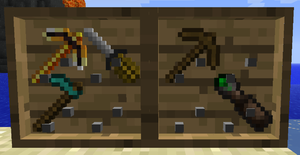 Right-click the rack with a tool on an empty slot and the tool will be stored in that location. Right-click a slot which contains a tool will pop it out of the rack. Shift-clicking will display the interface. This page was last modified on 26 May 2016, at 19:14.